Citation Information: J Clin Invest. 2007;117(12):3730-3741. https://doi.org/10.1172/JCI32967. The clinical utility of anthracycline anticancer agents, especially doxorubicin, is limited by a progressive toxic cardiomyopathy linked to mitochondrial damage and cardiomyocyte apoptosis. Here we demonstrate that the post-doxorubicin mouse heart fails to upregulate the nuclear program for mitochondrial biogenesis and its associated intrinsic antiapoptosis proteins, leading to severe mitochondrial DNA (mtDNA) depletion, sarcomere destruction, apoptosis, necrosis, and excessive wall stress and fibrosis. Furthermore, we exploited recent evidence that mitochondrial biogenesis is regulated by the CO/heme oxygenase (CO/HO) system to ameliorate doxorubicin cardiomyopathy in mice. We found that the myocardial pathology was averted by periodic CO inhalation, which restored mitochondrial biogenesis and circumvented intrinsic apoptosis through caspase-3 and apoptosis-inducing factor. Moreover, CO simultaneously reversed doxorubicin-induced loss of DNA binding by GATA-4 and restored critical sarcomeric proteins. In isolated rat cardiac cells, HO-1 enzyme overexpression prevented doxorubicin-induced mtDNA depletion and apoptosis via activation of Akt1/PKB and guanylate cyclase, while HO-1 gene silencing exacerbated doxorubicin-induced mtDNA depletion and apoptosis. 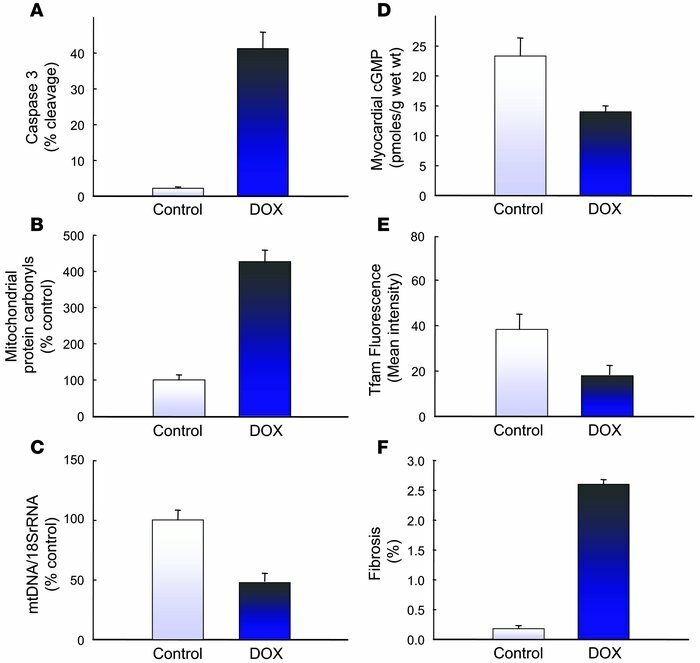 Thus doxorubicin disrupts cardiac mitochondrial biogenesis, which promotes intrinsic apoptosis, while CO/HO promotes mitochondrial biogenesis and opposes apoptosis, forestalling fibrosis and cardiomyopathy. These findings imply that the therapeutic index of anthracycline cancer chemotherapeutics can be improved by the protection of cardiac mitochondrial biogenesis. Cardiac injury in mice after DOX injection. The figure shows a 10-fold increase in caspase-3 cleavage (A; P < 0.01), a 4-fold increase in mitochondrial protein oxidation (B; P < 0.01), a 50% reduction in mtDNA content (C; P < 0.05), and a 40% decrease in cardiac cGMP concentration (D; P < 0.05) 14 days after a single DOX injection (15 mg/kg). In addition, the signal from the major transcription factor regulating mtDNA replication, Tfam, evaluated by in situ immunofluorescence, was reduced by 50% (E; P < 0.05). These changes were associated with a quantitative increase in cardiac fibrosis by Masson’s trichrome staining (F; P < 0.01).